« I Got a Cat! Anyway, I am now eight days old. I was born in a place called Spring, Texas, although from what I understand, it was not spring there. That’s another human thing, calling things something they are not. 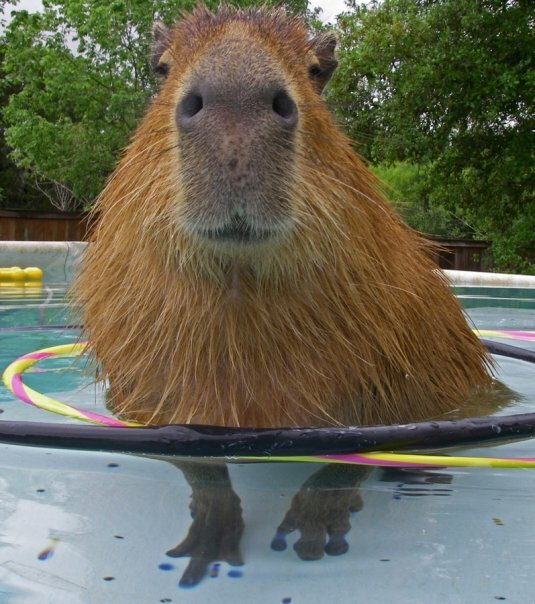 Which brings me to the point, I am a capybara, world’s largest rodent. The reason I am small now is because I am a baby. I will grow to be over 100 lbs, just like my mom and dad who are named Bonnie(2) and Clyde(2). 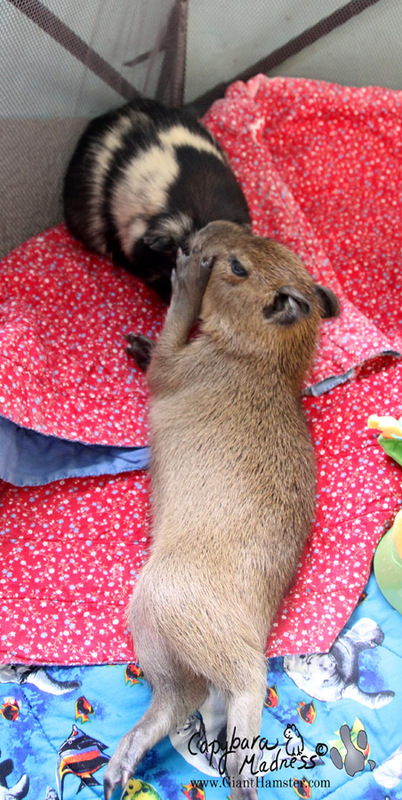 They have numbers after their names because there already was a pair of capybaras named Bonnie and Clyde. They were the parents of Caplin Rous and Dobby Winnick. That is another human thing, reusing names. Why do they have them in the first place if they don’t even uniquely identify you? All that aside, I am settling into my new home fairly well. Of course there is a lot to check out. An annoying thing is that everything seems to be indoors. Back in Spring, I never went inside but here I’m never allowed outside! At least not yet. Living inside seems very strange to me. And I miss my parents. But my new owner who goes by the name of Melanie (again, not a unique name and pretty meaningless), says that I’ll grow used to it and eventually like it. Right now I find everything here pretty scary. Well, not everything. 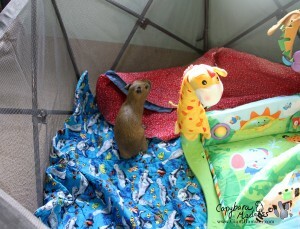 I don’t find my new play yard (also known as a playpen! What is it with these names?) to be scary. I kind of like the bright colors and soft bottom. I don’t like the mesh that keeps me from going where I want though. The two of us really hit it off! He likes me and I like him! I’d like him better if he would scratch my belly though. Isn’t that what friends are for? I promised him I would rub his belly after, but he didn’t seem interested. Here’s a video of me and WBB1 getting to know each other. As you can see, we are now best friends. Time to explain my name. A mudskipper is a type of fish that can crawl on land. An amphibious fish, if you will. A semiaquatic fish. 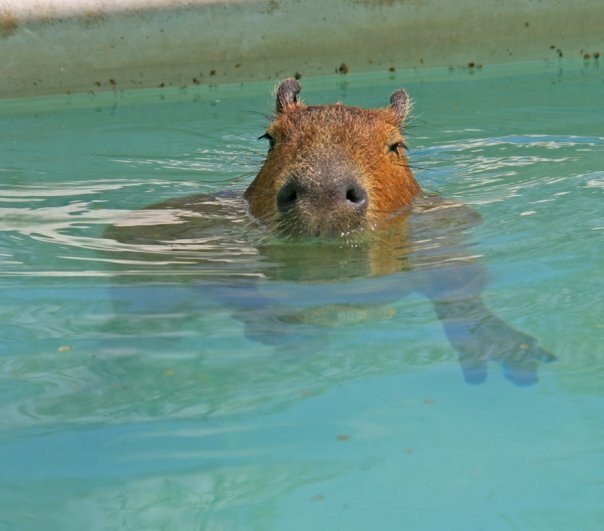 Since capybaras are semiaquatic, it is the perfect name for me. Plus I don’t think anyone else has the name Mudskipper Rous. Also, a long time ago some person called a pope (and there have been a lot of people named that!) 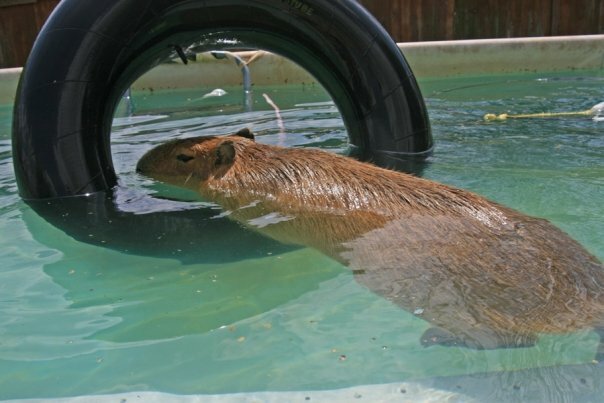 declared that capybaras were fish. This is clearly not true but Melanie has latched onto it. 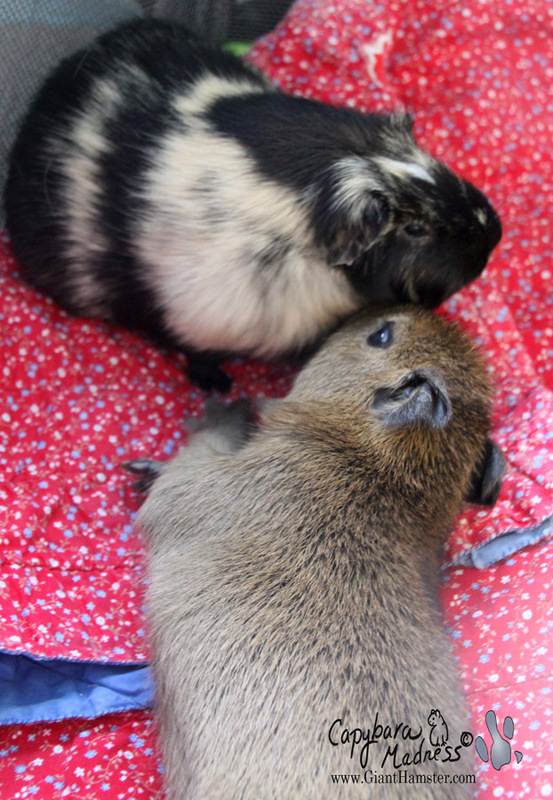 Her two previous capybaras, whose pawprints I hope to fill, were named Caplin and Garibaldi, both types of fish. Minnow and I will be fresh water fish so that’s a little different. In case you were wondering, I am drinking milk (goat milk replacement) out of a bottle now. I’ve also eaten a little bit of WBB1’s guinea pig pellets. Melanie offered me grass but I turned it down. I have been getting used to this new lifestyle and spent most of the night sleeping with Melanie or waking her up to ask for more milk. Nice to meet you Mudskipper! 8 days is not very old, you are very brave. I look forward to your stories as you grow. Welcome Mudskipper! Thank you for the update. You are a very cute little guy. We will enjoy watching you grow. Hello Mudskipper! I followed Gari and Caplin’s writing, too. You do have big shoes to fill, but so far you’re doing a great job 🙂 Hope to hear more from you soon. 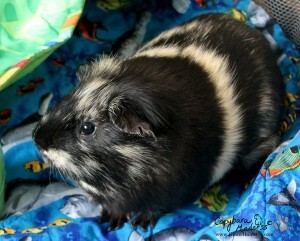 Hi Mudskippper I am Barley and like your WBB1 I am a guinea pig and even the same weight as your new friend. I have a super Capy like yours! Stuffed animals are very nice friends, I have a few and sleep with them, play with them and share my life with them. Being in a new home is scary I got here last April after a long ride in a car. I am looking forward to all the stories you have to share about your new life. He’s beautiful Mel! Soooooooooo happy for you. Nice to meet you Mudskipper Rous! You have a wonderful place to live with a wonderful human and co-pets, so you will be used to it in no time! Hugs and kisses from Maryland! Squee!! 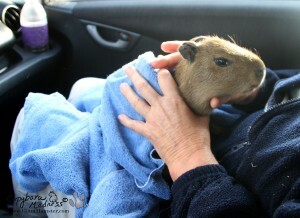 Baby capy! How exciting for you! And I love the name. Congrats! Our two Pembroke Welsh Corgis and my wife and I all congratulate Mudskipper Rous on finding his forever family with all its “co-pets”! We could not imagine you “capibara-less.” We’ll look forward to your – and Mudskipper’s – posts on his progress growing up and having a great life. Very happy to meet you. You have landed in a wonderful home. Lucky you! Muddy, you are a most handsome little capy. I look forward to hearing about your adventures with Melanie and all your new friends! So happy to “meet” your new baby! I hope you have many wonderful years together. I am just so delighted for you! I look forward to reading your blog. Your new baby is beautiful! Wonderful news! I am so excited to hear about baby Mudskipper Rous and his new home. Can’t wait to hear about all of your adventures together! Welcome to the world, little cutie! Why is this little guy not still with his mommy? Were there problems? In any case, I know Melanie & Rick will take wonderful care of him & give him a wonderful, loving home with with plenty of company; all those co-pets! Looking forward to watching you grow up and seeing what adventures you have, little Mudskipper! 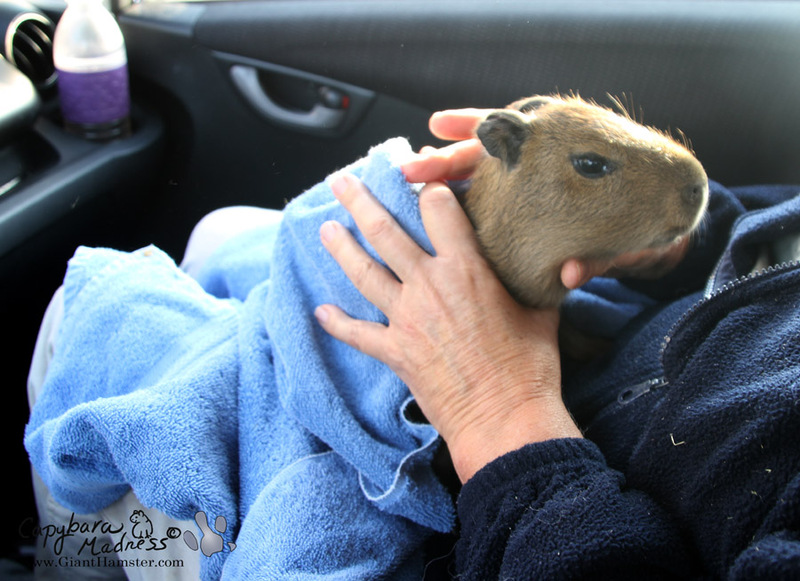 Captive baby capybaras are usually removed from their parents within two to three weeks. When they get older it is harder to get them to bond with humans. However, Mudskipper’s breeder wanted me to take him when he was only three days old but we delayed an extra four days. Of course he is still on milk even though he eats solid food such as grass, guinea pig food, hay, and equine senior. Oh, I didn’t know that about captive cappys. Thanks for explaining.And I had no idea that they started eating solid food so young! I would think you would be the next best thing to his mom & I know that you take good care of all your animals. The same holds true for “mini-pigs” (potbelly varieties). Most breeders insist on keeping them with mothers for 4 weeks. Others will bottle-feed them and then sell them at 2-3 weeks. The advantage of the latter is an animal that is apt to immediately bond with its new human parent whereas the fully weaned piglet as apt to be fearful and tentative, requiring to be won over with treats, etc. The disadvantage is that the bottle-fed piglet may be spoiled, more demanding, and more difficult to control (esp. maintaining a strictly regulated diet). Sometimes I suspect breeders of wanting to keep the piglet for themselves while it’s at its cutest (and most comical) best: age 10 to 30 days. Most breeders know that after 2 months the rapidly growing piglet will be of less value to prospective consumers. But I see a few breeders trying to get full price for a 5-month piglet! (By the time the pig is 6 months, I’ve seen many disenchanted owners abandon their confused and depressed pet piglet. 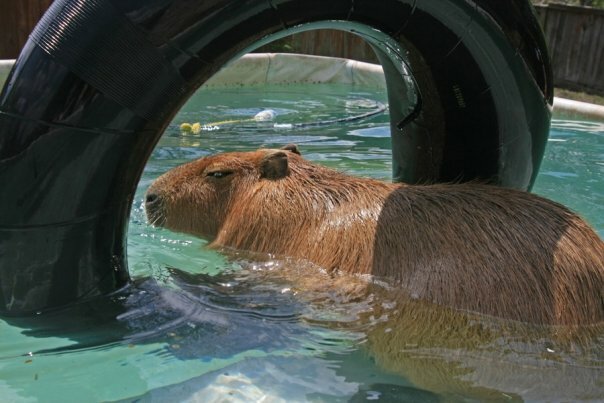 I’m curious to know if a Capybara’s expected lifespan is really no more than 6 years. (Pigs are 15-20 years, though most will be lucky to live 15 months). 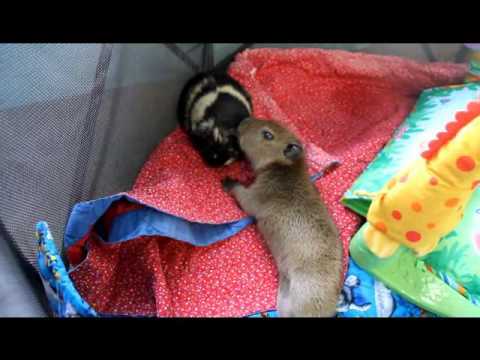 Also, among some of the collections of guinea pigs on Youtube, I’ve frequently seen one that looks like a “mini” capybara. Yet I can’t fancy that parents would allow a young girl to have such an animal in her GP collection. 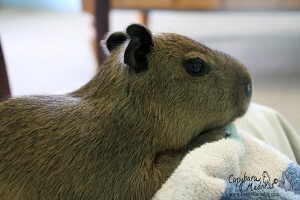 Is there a version of capybara that is drastically reduced in size, not growing beyond 5-10 pounds? 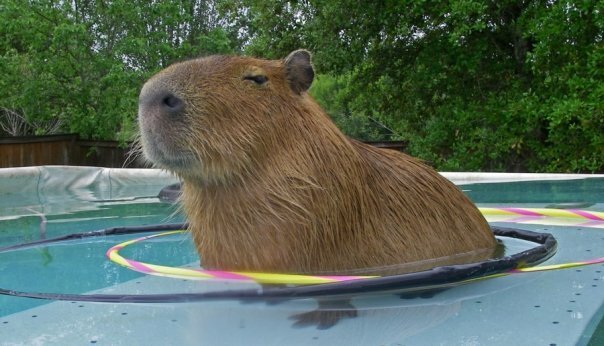 In the wild it is extremely rare to find a capybara more than six years old. However, in captivity they can live much longer. The record that I know of is 18 years. 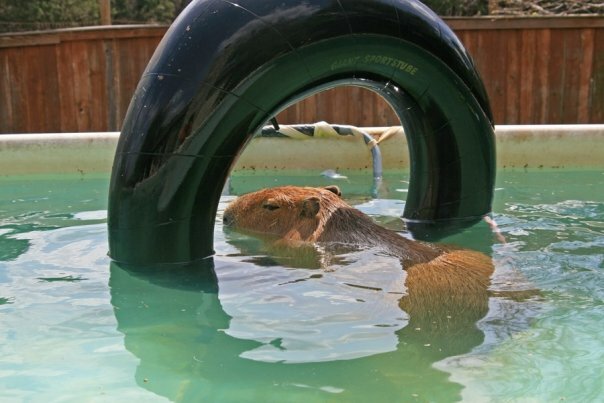 Still, most captive capybaras do not live anywhere near that long. 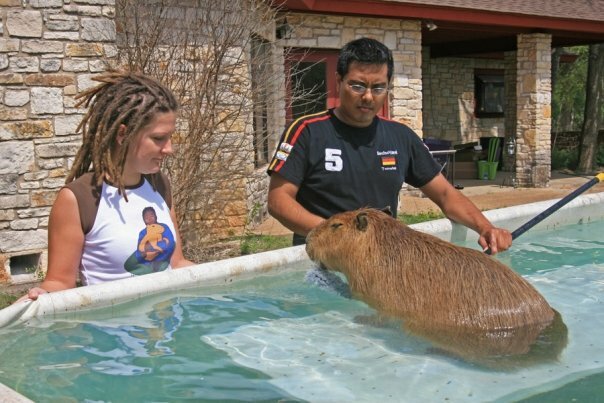 The ROUS Foundation is doing a study to determine the life expectancy of pet capybaras but the data is too preliminary now to make any assertions. 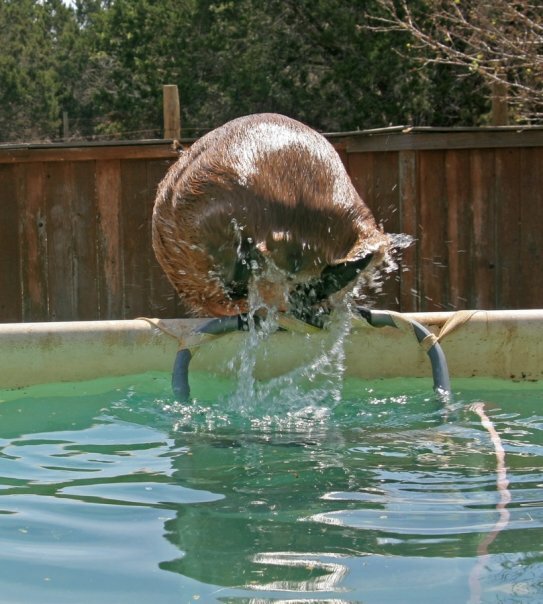 The lesser capybara tops out at about 80 lbs but there are no capybaras smaller than that. There are several other types of South American rodents that are related to capybaras but are much smaller, for instance the agouti. 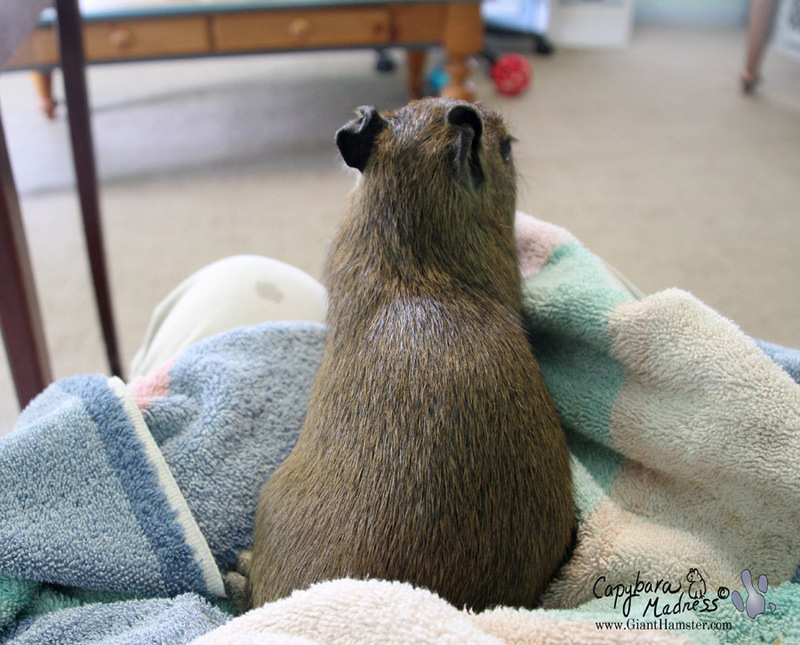 The mini-capybara that you’ve seen is in fact a guinea pig or possibly a cavy (slightly larger than gpigs). People often joke about their guinea pig being a mini-capybara. Welcome Mudskipper! Can’t wait to hear about your adventures and life with Melly. Welcome Mudskipper Rous! I’m delighted to meet you. OMG you have a new baby!!! Congratulations!!! Mudskipper (or may I call you “Muddy”), you are entirely too cute! 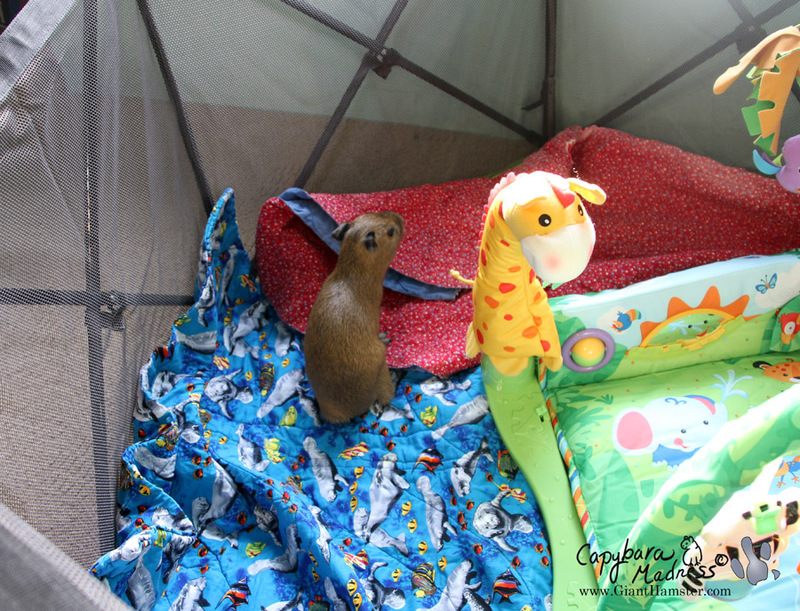 You have hit the jackpot — living with Melanie is an awesome thing for a capybara. Have fun exploring and keep blogging, little guy! I am so happy to meet you! I can’t wait to watch you grow up big and strong! !